There was a dreamlike quality for my recent return to the exquisitely restored Paramount Theatre of my youth. A product of the Roaring Twenties built in 1929, it has been the crown jewel of my Peekskill, New York hometown for most of the time since. I say “most of the time” because like many movie palaces during the rise of television, it fell into disuse and disrepair in the late 1950’s. That ushered in a period when local birds and bats ruled the decaying marquee of the closed and crumbling building. I distinctly recall offering up a prayer that the Good Lord would somehow bring back the glory of that great building where, as youngsters, we lined up around the block to attend those Saturday matinees so full of big-screen wonder. That prayer was answered ten-times-over many years ago when community & political leaders, donations, volunteers and foundation grants all combined to make possible what is now known as the Paramount Center for the Arts, a theater now known for classic film screenings, special events, and much sought after by national concert tours. 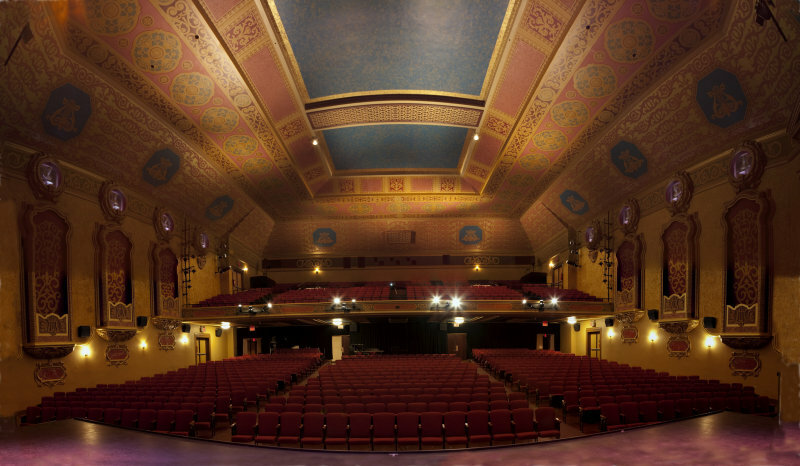 Once past the glittering marquee and polished wood and brass of the entrance doors, visitors discover plush seating and the handsome interior that makes it clear this theater has never looked better. 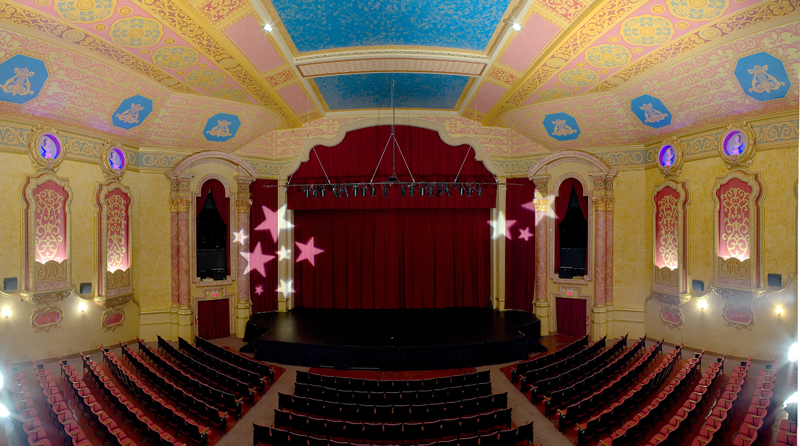 Perhaps best viewed from the cozy balcony, the intricate, ornate, and many-colored decoration of walls and ceiling within the stunning auditorium retains the original Neo-Classical flavor preserved through meticulous restoration. 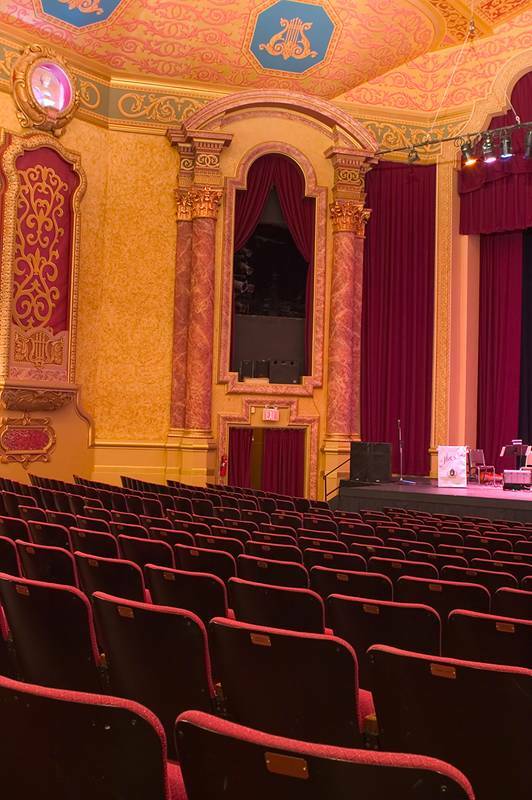 Ruby-colored curtains drape the stage, classic columns soar and accents of gold leaf abound. Illuminated and recessed busts of classic figures preside from on high atop the walls on either side. In a word, the room is breathtaking. 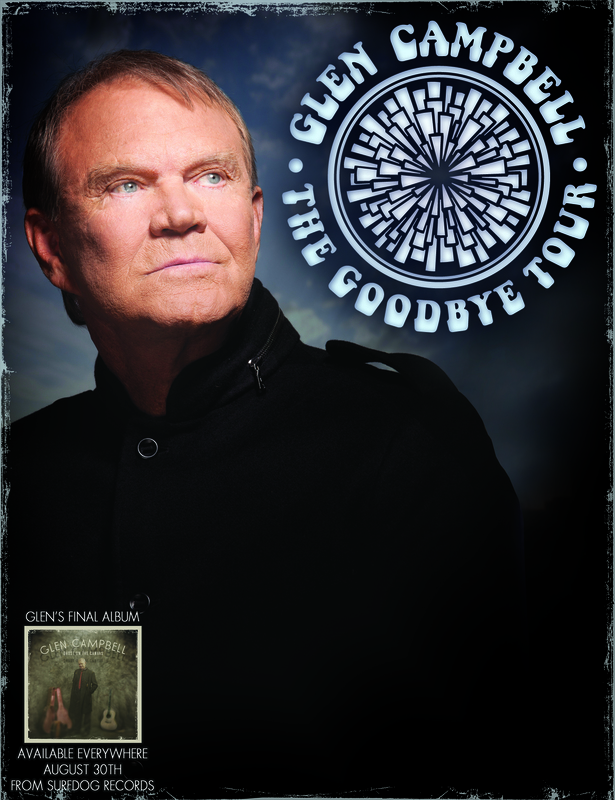 So when my sister, Sara offered me a birthday gift of tickets to GLEN CAMPBELL: The Goodbye Tour, how could I resist returning to this place where, nearly two decades ago, I got my start in a second career as a performing arts critic when writing occasional pieces for editor Kathy Daley and her Peekskill Herald newspaper. On the recent Friday night of Campbell’s performance, an air of excitement permeated the sell-out throng that gathered outside on a warm spring evening as the radiant marquee gleamed its welcome. The festive atmosphere quickly moved inside as many patrons visited the wine bars set up on both levels of the house. As one pleasant chap entered our row of seats with wine glass in hand, I joked, “Is that for me?” He later surprised me during intermission with a glass of my own. Interestingly, after the intermission that followed, the same musicians returned to join Campbell for his set, and his longtime musical director (on a second keyboard) also joined him. Happily, all the noisy excess volumes of the first set now faded away as the band calmed to offer music of a much more pleasant “flavor.” The star emerged in a western-style blue shirt with rhinestone decorations very appropriate to the man who made the song, “Rhinestone Cowboy,” such a winner. He seemed to immediately enter a time machine that allowed him to sound much the way we recall the voice from his now classic musical hits. If the voice was older, it had acquired a maturity that was solid and appealing, while only a few times did he appear to reach for a lyric line that escaped him. That was most evident in the latter part of the program when Campbell indicated several times that the chill of the stage air-conditioning was disturbing him. At one point during that bit of confusion, a sweatshirt was brought out to drape over his shoulders as he continued to amaze the audience with not only the fine vocals but also with his dazzling solo segments on guitar during familiar numbers like the whimsical, “Gentle on My Mind,” the cheerful, “Try A Little Kindness,” the Jimmy Webb composition, “Wichita Lineman,” and the title tune from 1969’s Oscar-winning film, “True Grit.” And speaking of Jimmy Webb songs, Campbell delivered a warm, embracing, “By the Time I Get to Phoenix,” a gently rolling, “Galveston,” and he even did nicely performing Webb’s less familiar, “Where’s the Playground, Susie?” Putting the guitar down for a time and wandering freely about the stage, he sang a beautiful, “Didn’t We,” and then moved on to the richness of, “I Can’t Stop Loving You,” as he yodeled a bit and playfully joked with the audience between bars of the song. And yodeling would be a highlight of the excellent “Lovesick Blues” that followed, and excellence would be on full display when he took guitar in hand to challenge daughter Ashley to a fiery, “Dueling Banjos” number. The audience roared its approval. 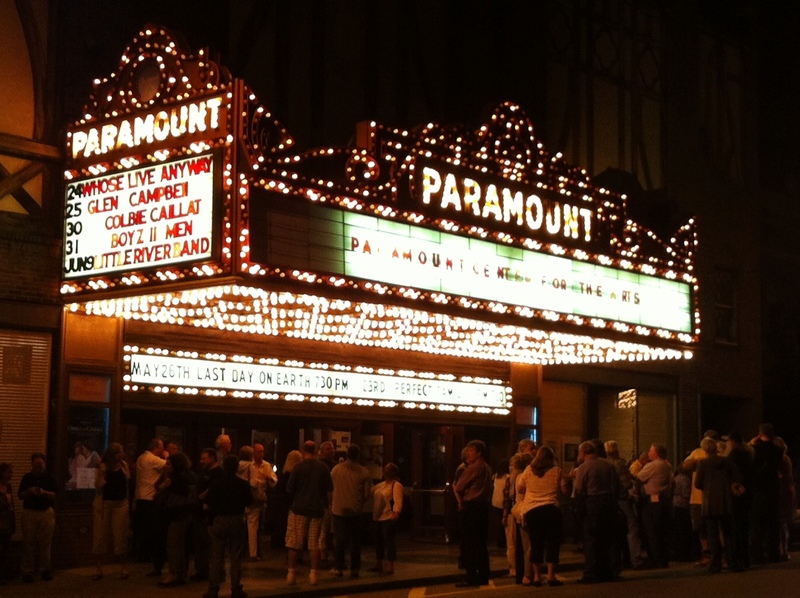 This entry was posted in BroadwayStars.com, Concert Reviews, ThePeoplesCritic.com and tagged Celebrities, concerts, music, Peekskill Paramount Center for the Arts, Reviews. Bookmark the permalink.